Slowly but surely our family has been weaning itself from our DirecTV subscription. We bought an AppleTV and a Roku (and will inevitably get a Chromecast, because I’m just geeky like that). Our Wii system streams NetFlix, and our iPads, Kindle, and laptops all serve as personal video players. There is no shortage of ways for us to zone out to mindless television (a popular family vice). So, I finally got around to calling DirecTV to see if my contract was up. What I learned is that they REALLY don’t want to lose customers. So much so that they cut my bill from $89/mo to $51/mo. They even tossed in additional free programming, all without entering a new contract. 3 minutes after sitting on hold for 15, I had aggressively cut into the cord, but pulled back just before slicing all the way through. What a terrible way to do business. Yes, I ultimately decided to stick with DirecTV (for now). But it’s definitely not because I appreciate them “taking care of their very loyal customer”. Nope. Maybe if they’d preemptively called me and offered this without me threatening to cancel I’d appreciate them. For me it’s all business, just like it is for them. $89 is not worth it, but $51 barely is, considering they have a strangle hold on ESPN. But guess what happens when ESPN offers online streaming for anything less than $50/mo. Yep, I’m gone. Immediately. Guess what else? Now I’m excited to tell you all to immediately call DirecTV (or Dish or Time Warner or whomever) to see if your contract has expired. 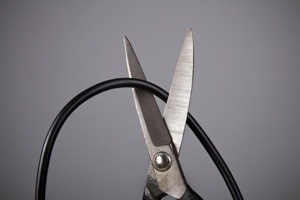 Because you, too, could save some serious cash by cutting into your cord. What Is / Why Should You Definitely Use 2-Factor Authentication?